The Vice President, Shri Mohammad Hamid Ansari releasing a book entitled "Swatantrata Senani Raja Mahendra Pratap", edited by Shri Raghuvir Singh ‘Arvind’, in New Delhi on July 16, 2015. 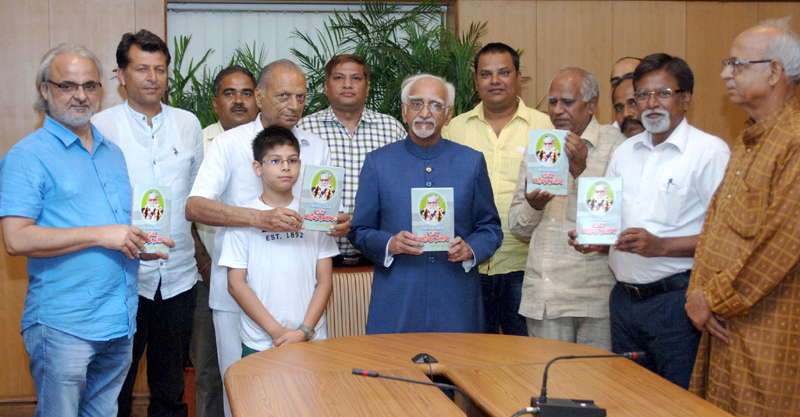 The Vice President of India Shri M. Hamid Ansari released a book entitled “Swatantrata Senani Raja Mahendra Pratap” edited by Shri Raghuvir Singh ‘Arvind’ at a function here today. Addressing on the occasion the Vice President said that Raja Mahendra Prarap was a true nationalist and his ideas were far ahead of their time. He opined that his Memoir should be made available in book and documentary forms for wider reach among the masses so that people may learn from his great contribution in freedom struggle. He complimented the Editor of the book for bringing out such a useful book. The book highlights that Raja Mahendra Pratap never compromised with his political thoughts and was very influenced with the Gadar Revolution of 1913-15. He migrated to Afghanistan leaving all his lands and properties in India and in 1915 he established first provincial Government of India in Kabul along with his accomplice Barkatullah Khan and Maulavi Abaidullah Sindhi. He returned to India after World War –II when India was about to get Independence. He was of the view of the formation of a Great Union from Afghanistan to Sri Lanka which was not possible due to partition. The Chief Minister of Nagaland, Shri T.R. Zeliang, accompanied by a delegation of MLAs, calling on the Prime Minister, Shri Narendra Modi, in New Delhi on July 16, 2015. The Chief Minister of Nagaland, Mr. T.R. Zeliang, today called on the Prime Minister, Shri Narendra Modi. He was accompanied by an 18 member delegation of MLAs, comprising the entire political spectrum of the State. The delegation assured the Prime Minister of their firm commitment to the Naga Peace Process. They mentioned that the people of Nagaland, including various civil society groups, were committed to peace. The delegation sought an early settlement to the Naga Political Issue. The Prime Minister assured the delegation of his Government's unflinching commitment to development of the entire North-East region. He referred to his meeting with the Chief Ministers of the North-Eastern States yesterday, under the aegis of the NITI Aayog, and said the various infrastructure projects initiated by his Government had the potential to transform the region. The Prime Minister said his Government is working sincerely towards a solution to the decades-old Naga Political Issue. The National Security Advisor, Shri Ajit Doval, was present at the meeting. The Cabinet Committee on Economic Affairs, chaired by the Prime Minister Shri Narendra Modi, has given its approval for development of the six laning of Eastern peripheral expressway (National Highway No. NE-II) in Haryana and Uttar Pradesh. The cost is estimated to be Rs.7558 crore including Rs.1795.20 crore for land acquisition, resettlement and rehabilitation and other pre-construction activities. The total length of the road will be approximately 135 kms. This work will be under the Engineering, Procurement and Construction (EPC) basis. Cost towards toll equipment , wayside amenities etc. The Cabinet Committee on Economic Affairs (CCEA), chaired by the Prime Minister Shri Narendra Modi, has approved the creation of an intra state transmission system in the States of Andhra Pradesh, Gujarat, Himachal Pradesh, Karnataka, Madhya Pradesh, Maharashtra and Rajasthan at an estimated cost of Rs 8548.68 crore with Government of India contribution from National Clean Energy Fund (NCEF) of Rs 3419.47 crore (40 percent of the total estimated cost of project). The activities envisaged under the project includes establishment of 48 new Grid sub-stations of different voltage levels with total transformation capacity around 17100 MVA (Mega Volt Ampere) by installing over 7800 ckt-kms (Circuit Kilometers) of transmission lines in these seven states. The project is proposed to be completed within a period of three to five years. These States are rich in renewable resource potential and large capacity renewable power projects are planned there. Creation of an intra state transmission system will facilitate evacuation of renewable power from generation stations to load centres. Ministry of Agriculture, with the consensus of the Ministry of New and Renewable Energy, has introduced solar energy pumping systems under the” Sub Mission on Agriculture Mechanization” implemented through State Governments to cope up with the growing demand of solar pumping systems in irrigation,. 2. Beneficiaries: Individual farmers, SHG/UC of farmers/Cooperative societies of farmers/FPO’s/entrepreneurs. Solar energy is a proven clean, silent resource that offers both economic and environmental benefits. Solar energy driven pumping sets is a viable alternative for electrical and Diesel pumping systems in farm irrigation for farmers. Solar water pumping system can drastically improve your Farm electric and diesel bill and one that makes sense. For all these reasons, it has increased the demand of Solar pumping Systems as a substitute of Diesel and Electrical pumping Systems for irrigation in Agriculture Sector. To ensure quality of agricultural machines to be supplied in the Government assistance programmes, testing of machines at any Farm Machinery Testing and Training Institutes (FMTTIs) or 29 designated testing center is mandatory. Now Government has authorized Central Institute of Post Harvest Engineering and Technology (CIPHET-ICAR), Ludhiana as a 30th designated testing center to test all types of Post Harvesting Equipment and Machinery. Government of India, Ministry of Agriculture, and Department of Agriculture & Cooperation has introduced Sub Mission of Agricultural mechanization (SMAM) w.e.f. 2014-15 with the aim to accelerate growth of agricultural mechanization in India. Financial Assistance for Procurement of Agriculture Machinery and Equipment is provided in the SMAM scheme as well as in other schemes like Rashtriya Krishi Vikas Yojna (RKVY), National Food Security Mission (NFSM), National Mission on Oilseeds and Oil Palm (NMOOP), Mission for Integrated Development for Horticulture (MIDH).